When customers ask for bids, they expect a professional bid that not only looks professional, it is accurate and contains all of the terms and conditions that they need to be aware of. They will often bypass bids that do not meet these criteria in favor of others that are more professional looking that might even be higher priced. We have a bid quotation template that will help you compete with the best of them in your field. 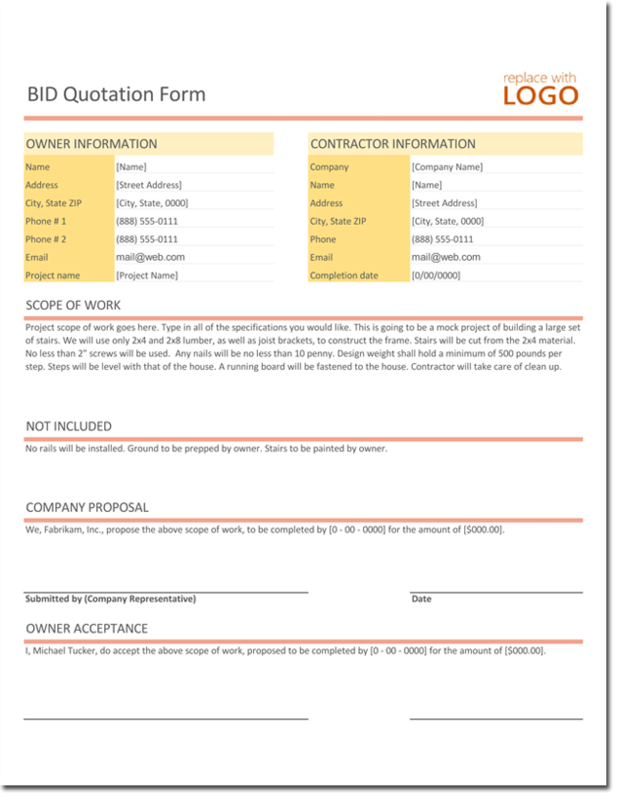 Our bid quotation template can be downloaded in either Microsoft Word or Excel and personalized to your company’s needs. This template can include serial numbers, notes, terms and conditions that will be pertinent to your business and the bid you are making. One of the best features is that your own logo can be added to the template to truly personalize it for your company. When your sales team send a quotation to your customers, they will be using a personalized bid quotation template that looks professional and will make your bid stand out from the others. Getting your bid looked at is half the battle. Of course, you need to make sure that the bid is competitive and contains all of the details the customer is looking for. Download this quotation template today in Microsoft® Excel and customize it to meet your needs. Add serial numbers, notes, terms and conditions along with your logo to have your own quotation template for your sales team to use. Whether you are the sales person or you have a hundred-sales people working for you, this template will help you beat the competition. Personalize this sample quotation to create your own bid quotation template.